We offer options for mounting such as welding, bolting, rail and strut mounting, double and group mounting, etc. Behringer CH Series Compact Hygienic. Dynamic "Anchor or Guide" Slope Adjusting Hanger/Rod Mount Unit is a one piece unit with attached dynamic rod. Hanger rods are available in lengths ranging from min. of 1.26" to 96". Standard length is 6". Features a dynamic union between the hanger rod and hanger housing allows for the housing to self adjust to the tubes slope for drainability as well as a 360° swivel. Threaded "Anchor or Guide" Hanger. One piece unit with threaded adaptor. Rod is sold separately The threaded mounting section, on top of housing, doubles as a threaded rod connecter and a welding platform. This type rod connection does not offer the dynamic slope adjustment feature. Rigid “Anchor or Guide” Support with Weld Plate. One piece unit with weld plate attached to hanger housing. Compact housing is mounted on a weld plate. This type mounting configuration does not offer the dynamic slope adjustment feature. Smooth Bore Series Sanitary Pipe Clamp Weld Plate Mount. 1/4" outside diameter through 8.625" outside diameter. Smooth Bore Series Sanitary Pipe Clamp Hang Plate Mount. 1/4" outside diameter through 6.625" diameter. Smooth Bore Series Sanitary Pipe Clamp Base Plate Mount. 1/4" outside diameter through 6.625" diameter. Smooth Bore Series Sanitary Pipe Unistrut Mount. 1/4" outside diameter through 4" diameter. Typically used in stacking assembly- Replace the COP at the lowest point of upper assembly with a SWV. Smooth Bore Series Sanitary Pipe Rail Mounting. Rail accommodates clamps from 1/4" through 4" tube. Smooth Bore Series Sanitary Pipe Rod Mount. Smooth Bore Series Sanitary Pipe Stacking Kit. 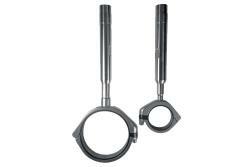 Any double combination of sizes 1/4" outside diameter through 3.5" outside diameter. CH Height Adjuster designed for fine tune slope for process lines to achieve full drain-ability. This tool is designed for convenient tightening of the acorn bolts on our CH series hangers. 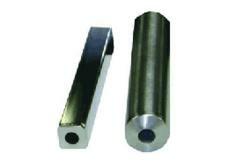 304 or 316 Stainless Steel; Carbon or Electro-Zinc Plated Carbon Steel. 3/8" outside diameter to 1" outside diameter with different rod lengths and connection threads available. The Telescopic Adjusting Round Floor Mount Stand allows the housing’s rod elevation to be adjusted up to 2” from the base plate’s surface. The rod attached to the housing slides inside the base plate’s elevation adjustment tube. 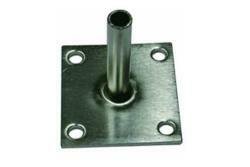 One piece CH Series Rod Stand Plate with rod cut to specified length. 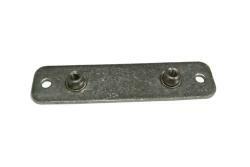 The rod is welded to the base plate, which can be supplied with or without anchor bolt-holes. Anchor bolts not supplied by Behringer. 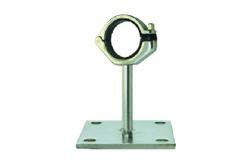 Hanger Stanchion with square round tube cut to specified length. One end of the tube has a capped end with a rod hole. The rod hole is used for telescopic adjustment of the hanger rod. Specify the steel finish and the finish on the weld. 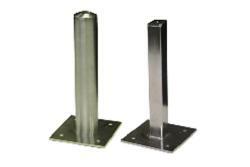 One piece Floor Stand with square or round tube cut to specified length. One end of the tube has a capped end with a rod hole. The rod hole is used for telescopic adjustment of the hanger rod.